KING GEORGE ISLAND, Antarctica (AP) — Sophrony Kirilov pulls hard on the strings of the heavy Russian bells from inside the world’s southernmost Eastern Orthodox church, calling to Mass anybody wanting to pray on this remote Antarctic island. The 38-year-old Russian priest is clad in a loose black robe and a vest dotted with patches of penguins and seals, marking his four years of service at the bottom of the world. Although he often misses his family and the dark winters are hard, Kirilov says there is no place he feels closer to God than in this frigid land. “In the world there’s no tranquility and silence. But here, it’s quiet enough,” Kirilov said inside the Holy Trinity Church. The small wooden building is perched precariously on a rocky hill above a smattering of pre-fabricated houses for scientists and service workers who call this frozen continent home, at least part of the year. Kirilov, who also works as a carpenter and mason at the Russian Bellinghausen base, says his passion for Antarctica is deeply connected to his love for the lonely building. Russian priests here rotate in for yearlong stints, primarily to celebrate Mass for the workers on the Russian base, who number between 15 and 30 at a time. The priests also welcome any of the island’s other inhabitants, about 100 in winter when temperatures can plunge to -13 Fahrenheit (-25 Celsius), and 500 in the still-chilly summer months. The greyish clapboard church was first built in Russia from Siberian cedar planks treated to withstand the frosts and harsh wind. It was then disassembled and shipped log-by-log, “like Lego blocks,” to Antarctica, said Alejo Contreras, a Chilean Antarctic explorer who witnessed the construction and consecration in 2004. To protect it from strong winds, it is bound to the nearby rocky mountain with chains. In the summer, tourists and the staff of the international stations brave strong winds to hike up here, leaving snowy, muddy boots at the entrance. Some pray in silence, standing or kneeling because there are no pews in the boxy interior, while others marvel at the gold-leaf iconostasis screen of icons painted with bearded saints and winged angels in vivid colors. During Sunday service, Kirilov reads from the scriptures in Russian and sings in an angelic voice. 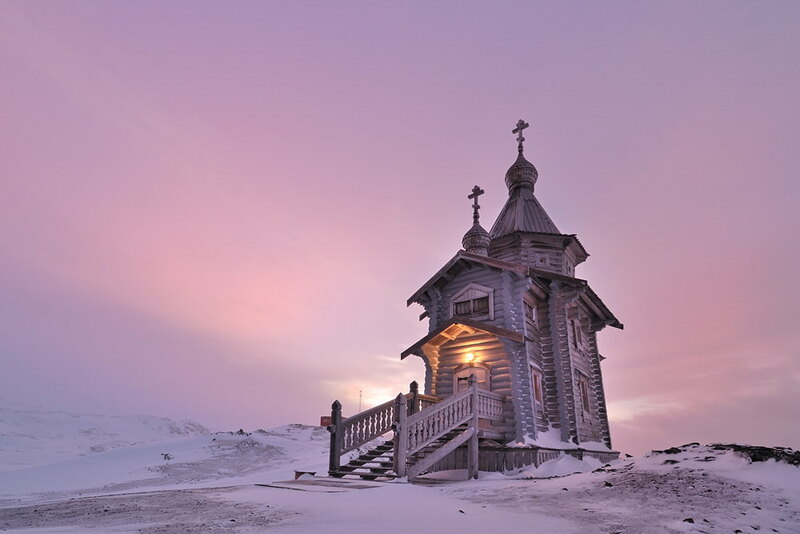 “A Russian polar worker, as any other believer, wants spiritual support nearby, a church devoted to God,” said Kirilov, who has a flowing salt-and-pepper beard and blue eyes tinted with gray. Reaching the church’s pointed belfry requires climbing up a staircase and squeezing in through an attic-like, square hole. At most, three people, rubbing shoulders, can fit next to the heavy bells that pierce the snowy silence with a cacophonous and hypnotic sound similar to the clang of a railroad crossing. At night the church is lit from below and becomes a beacon for ships crossing the South Sea. “Thank God for this gift to us,” Kirilov said, adding that he wishes more than a handful of people would attend Sunday service. 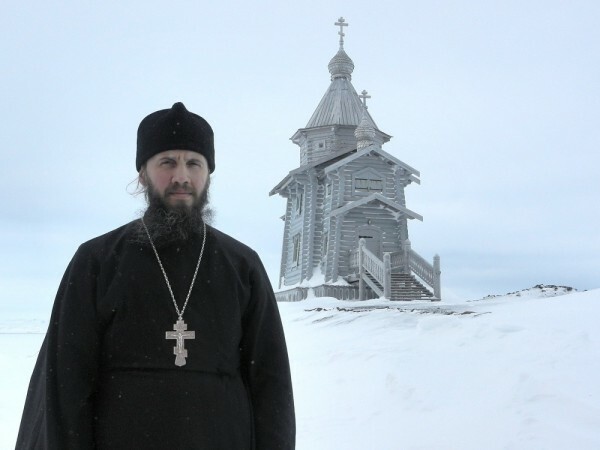 The church, nearly 10,000 miles (16,000 kilometers) from Kirilov’s monastery near Moscow, is just a few ice-covered steps from the red, bunker-like building that he calls home when he is in Antarctica. A pair of skis the priest uses to explore the island leans against a wall near the front door, where Kirilov painted flowers to remind him of nature during the dark winter months. A stuffed toy Emperor penguin is connected to one of the windows with a suction cup. Inside, the walls are covered with maps, pictures of Russian churches and a painting of London Bridge. Penguins are his favorite animals, but Kirilov says he has also made friends with three large brown skuas, Antarctic scavenging birds often seen hovering outside his doorstep, waiting for the priest to toss them fresh fish. “Since 2008, I constantly meet them here and talk to them,” the priest says, recalling the time a skua tried to make off with his pointed monk hat. “Sometimes they become naughty,” he smiles. During his time off, Kirilov also follows Russian news online using a desktop computer that gets spotty Wi-Fi from the base. Kirilov says his parents and four siblings, including an identical twin who also took monastic vows, are eagerly awaiting his return to Russia in April. While he will be happy to see his family after the four-year stint in Antarctica, Kirilov says the moment he leaves he know he will be pining for this forbidding land.